Mikkelsen and 3D Graphics: How to do more generic mixing of derivative maps? How to do more generic mixing of derivative maps? I have added a shader to the demo which shows how to do mixing of derivative maps in a more typical scenario in which auto bump scale is used and all derivative maps are using same base unwrap but using different scales and offsets on the texture coordinate. 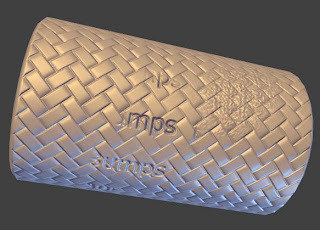 The auto bump scale is what allows us to achieve scale invariance like we are used to with normal mapping. VirtDim / sqrt(abs(VirtDim.x * VirtDim.y)) as a constant. Furthermore, this vector constant is ±1.0 when VirtDim.x == VirtDim.y. Finally, the scale and offset which is applied to the texture coordinate can be moved to the vertex shader. However, this requires the use of multiple interpolators so this might not be the preferred way. One relevant thing to notice here is that the numerator VirtDim is a float2 and not part of the bump scale. It serves to convert the height derivatives to the normalized texture domain from which we apply the chain rule. The factor 1 / sqrt(abs(VirtDim.x * VirtDim.y)) on the other hand is part of the bump scale. The distinction is subtle when doing bump mapping but becomes relevant when we do parallax mapping. where g_fMeshSpecificAutoBumpScale is the square root of the average ratio of the surface to normalized texture area. There is code which shows how to calculate this in the demo. The final value bump_scale is the same as the value which is returned by SuggestInitialScaleBumpDerivative() in xNormal. I am a director of graphics at Unity Lab SF. I have a masters in computer science and a bachelors with a double major in math and computer science.